The point of today’s talk is to describe briefly three expeditions to K2 and Mt. 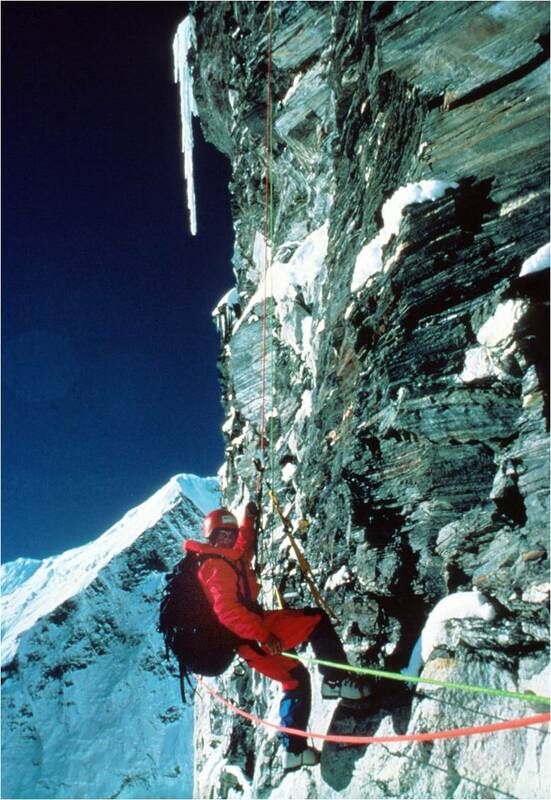 Everest in 1978, 1981, and 1983 and the impact of such extraordinary adventures on my later science and current adventure in seeking deeper scientific understanding of the autism disorders. I graduated from Harvard as a Biology major with a strong love of the outdoors and mountains, anticipating Ph.D. training in Biochemistry at Stanford. I never imagined then that my career would include a diversion of seven expeditions to the Himalayas and Karakorum. Exciting adventures full of intense interpersonal interactions, stress, success, but also failure and tragedy. My colleagues and I saw each other at our best, but also our worst. It is not worth the time needed to explain how I took such a series of life detours. Expeditions to these countries in the 1960s, 70s, and 80s were magical experiences of exposure to fascinating and very different cultures in beautiful and enchanting environments. In that era, our only communication was by mail runner. It took weeks to receive and months to respond to letters from family and friends. We felt very isolated from the world and were completely dependent on our teammates and ourselves with little possibility of help in medical or other emergency. My three prior expeditions to mountains in Nepal and India resulted in my invitation to join the 1978 American K2 Expedition. When invited, K2 had been climbed only once by Italians in 1954. We were the 6th American expedition to K2, following expeditions in 1938, 1939, 1953, 1960, and 1975 that had been epics of human heroism and tragedy. There was no mountain that Americans wanted to climb more. We felt tremendous pressure to succeed. K2 is very remote! To get to base camp, we had to hike along the Braldu River, a torrent in flood, noisy because of massive boulders being rolled downstream. It took us 10 days beyond the last village to reach base camp, and most of this trip was over the 50-mile length of the Baltoro Glacier. Logistics were intimidating—for every two porters carrying loads for us, one porter had to be hired to carry food for the two; one more for every two food carriers, and so on. Our base camp at 16,000 feet was the lowest we would be for 68 days. Our route was an unclimbed border ridge with China, the NE ridge with a mile-long horizontal traverse along a corniced ridge. For 35 of the 68 days we were pinned in tents by heavy monsoon snowfall. Storm inhibited progress not only during bad weather, but also afterwards because of avalanche danger. Differences in opinion on the safety of snow-bearing slopes led to vigorous disagreement and insults questioning judgment, courage, and commitment. Team morale and commitment weakened under stress. As summer turned to fall, failure seemed certain. Jim Whittaker ordered porters to arrive on September 10 to evacuate the expedition. Four us were left high with a faint hope the weather might improve. Just when things seemed hopeless, we got a surprising five-day break between monsoon and winter storm in early September. Jim Wickwire and I reached the summit as sun was setting on September 6. I had no oxygen, parka, or camera and left quickly. Wickwire had oxygen, parka, and camera and lingered to take a full panorama, leaving 30 minutes after me. I found our tent at 9:00 p.m. in a ground blizzard and darkness. Triumph almost became tragedy when Jim decided instead to bivouac 700 feet below the summit. Somehow, with immense will he came down to our high camp the next morning. It took us five long days to descend the mountain to base camp with little fuel and energy provided by rehydrating dried food in our stomachs. Wickwire became weaker every day. At Base Camp, our porters put Jim on a stretcher and carried him 45 miles down the glacier over four days with minimal rations until they got low enough for Jim to be evacuated by helicopter. Wickwire deteriorated every day and without the porters almost certainly would not have survived. Before this, we had really stereotyped our porters as greedy, unreliable, and untrustworthy. What a mistake. They were our real heroes. Balti Shiite porters who barely knew us and were paid almost nothing. They saved a life and let us return to the States with pride, not sorrow. The dissolution of our morale was public as well as complete, since we had with us a film crew and, most embarrassingly, a reporter, Sir Edmund Hillary. Finally we retreated from above the rock overhang, partly because of low morale and also concern about avalanche above. From the safety of San Francisco, of course, our fears changed to concern that another expedition might use the ropes we had left behind. Returning in 1983, everything seemed less intimidating. We knew the way up the lower face. The weather also smiled on us with no major storm during September. On October 8, three of us reached the summit on a warm, sunny, and windless day; three more followed on the 9th. We then had our first major storm that created tremendous avalanche danger and eliminated anyone else’s thoughts of reaching the summit. If this storm had arrived a few days earlier, we would have failed yet again. No film crew, no reporter, no bad weather, certainty about which way worked, high morale helped by rapid progress, and wonderful weather. The 1981 and 1983 expeditions could not have been more different. No close calls or heroics. The gods truly smiled on us. The journey is more important than the endpoint. In science or life, little time is spent at 28,000 ft.
Persistence is important, even when failure seems certain. Success or failure depends on the quality of the people you are with. Trust is essential. In science, like life, optimism and confidence make a huge difference. You cannot do more than you can imagine as possible. K2 taught me what a mistake it is to prematurely judge people. We underestimated the humanity of our porters on K2. It is equally dangerous to conduct experiments without being open to surprising results. As in climbing, you have to expect unexpected challenge and surprise in science. You simply do not know what you will encounter. The mountains have shown me the difference between disappointing experiences, such as rejection of a grant application by an NIH study section, from the truly devastating, such as losing a fellow climber as almost happened to my comrade, Jim Wickwire. Success on K2 required preparation, and persistence when failure seemed certain, a break in weather in early September that made the summit possible. Success in science requires the same qualities. Luck plays an equal role in choosing a scientific problem, since it is often not clear if technology is up to the task, and there are always unexpected surprises that block or delay progress. Currently, neuroscientists find themselves in a similar position to ours when we first challenged the east face of Mount Everest. We have developed tremendous technologies in genetics, microscopy, and imaging that have informed our understanding of human sensory perception, memory, cognition, and behavior at the same time as we are challenged by an aging population faced with degenerative diseases, such as Alzheimer’s, and have increased awareness of behavioral disorders, such as autism, depression, and schizophrenia. My current position at the Simons foundation certainly involves as much adventure as Everest or K2: Our goal is to support science focused on overcoming the most challenging barriers to more effective diagnosis and treatment of autism, an adventure to make lives better. Wish me luck in the final episode in my career!